In the rubble of Hurricane Maria, Puerto Ricans and ultrarich “Puertopians” are locked in a pitched struggle over how to remake the island. Join us for an urgent conversation entitled "The Battle for Paradise| La batalla por el paraíso" featuring Juan González, Naomi Klein, Elizabeth Yeampierre, and Katia R. Avilés-Vázquez about how the forces of shock politics and disaster capitalism are seeking to undermine the nation's radical, resilient vision for a just recovery. 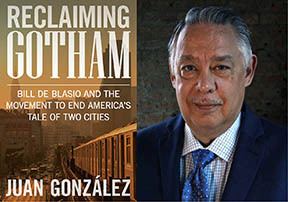 Copies of Reclaiming Gotham: Bill de Blasio and the Movement to End America's Tale of Two Cities will be sold at the event. Hosted by Haymarket Books. Registration requested; Eventbrite registrants will be admitted first; all admission is first-come, first-served.